Emily Sly will speak about all the wonderful programs the library offers to help meet their mission statement to nurture imagination, connection and understanding. To improve lives and strengthen community. 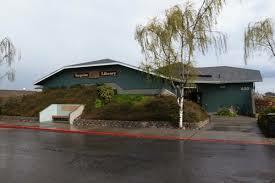 She will also speak about potential expansion opportunities for the library building in Sequim. Please join club members at 11:45 am at Baja Cantina this Thursday, August 9th for our regular lunch meeting. If you're unable to come in person, feel free to join us using Go-To-Meeting and join Sequim Rotary.